Whether you consider emojis innovative or not, Sony’s outdoor digital ad campaign to promote its Emoji Movie definitely is. The digital billboards respond in real-time to current weather and traffic conditions. 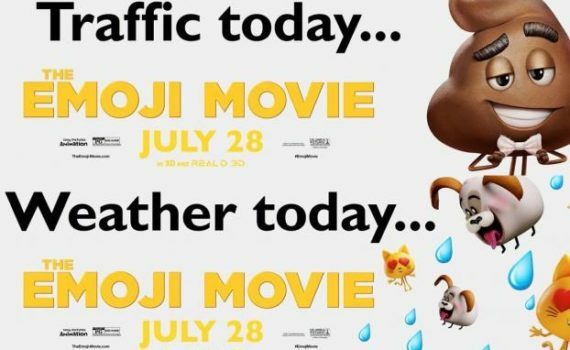 Using real-time, contextual triggers the many faces of the upcoming “The Emoji Movie” are now entertaining drivers on billboards in Chicago, Boston, Dallas, Phoenix, Seattle, Atlanta and Orlando. If traffic is gridlocked, drivers see a meh-faced Gene (TJ Miller) or Poop (Patrick Stewart). Good traffic flow summons the Happy Smiler (Maya Rudolph). If it’s a pleasant 72 degrees and sunny, passersby see a smiling, shades-wearing Gene, but if it’s not pleasant, the Devil (Sean Hayes) appears. And, if it’s raining cats and dogs, those tumble down as well. The ads are running through July 30. “The Emoji Movie,” produced by Sony Pictures Animation and distributed by Columbia Pictures hits theaters on Thursday, July 28.